It was raining on that spring day when my colleague Enrico and I sat in front of a computer monitor in the foothills of the Alps in northern Italy where our factory is located when reality set in that we were going to embark on the most insane project in our career. Just one month earlier we had met Rob Bianchin and Mike Hebor of the American company Cabot Guns at the IWA Outdoor Classics in Germany and immediately found a shared passion for excellence. Two days later Cabot challenged us to create a unique tungsten carbide blade to be adorned by 4.5 billion-year-old meteorite handles and to be known as the Big Bang Knife. I am a second generation artisan from a family who have dedicated their entire craft to the engineered material tungsten carbide. In fact, our slogan for two generations has been “exceeding carbide technology” as our family has found ways continually to push the limits on this remarkable material. Day in and day out, we craft some of the most precise tungsten carbide components ever created by man. Our company -Turmond s.p.a. – works in the shadows for many industries to make possible many products that affect your life. Yet, on that day, in front of that computer, we felt for the first time a certain freedom, the type of freedom one experiences when restrictions are removed and guidelines do not exist. Designing a tungsten carbide knife is an extremely difficult challenge where certain geometry needs to be respected. Our vision in crafting the Big Bang Knife was to create an elegant, stylish knife while avoiding the temptation to overdesign the blade. Another design challenge was to incorporate elements related to Cabot’s Big Bang meteorite pistol set for which this knife would be a related object of art. The initial concept was to employ the letter M denoting meteorite within the design of the knife but after further contemplation, we settled on the double (BB), one bigger one smaller – Big Bang. It’s a curious fact, but a true one nonetheless, that no one has ever made a tungsten carbide knife before, and it is also equally curious that no one had ever created an alphabetical letter in tungsten carbide. In one fail swoop, we were doing both. And this, after two generations of working in rigid industrial design applications with tungsten carbide … this is what I call freedom. With the basic elements of the Big bang knife designed, we all knew something special was in the midst of creation, even if it was just a profile at this point. The real magic of fine tuning the design would take place during the grinding operations. Tungsten carbide, after sintering, is a hard material that can only be shaped using diamond grinding wheels. It cannot be easily cut or shaped as you can with steel. Given that we are not knife designers by trade, we knew we had to play to our strengths and strength is our highly specialized knowledge in precision grinding technology. And we would employ this to create a very precise blade – the most precise blade ever made by man. Tungsten carbide, given it’s superior hardness to steel, can be crafted to higher tolerances and to micron level precision. You may find it interesting to know that Tungsten Carbide is an engineered material and starts as a mix of powdered chemical compounds of primarily tungsten, carbide and cobalt. 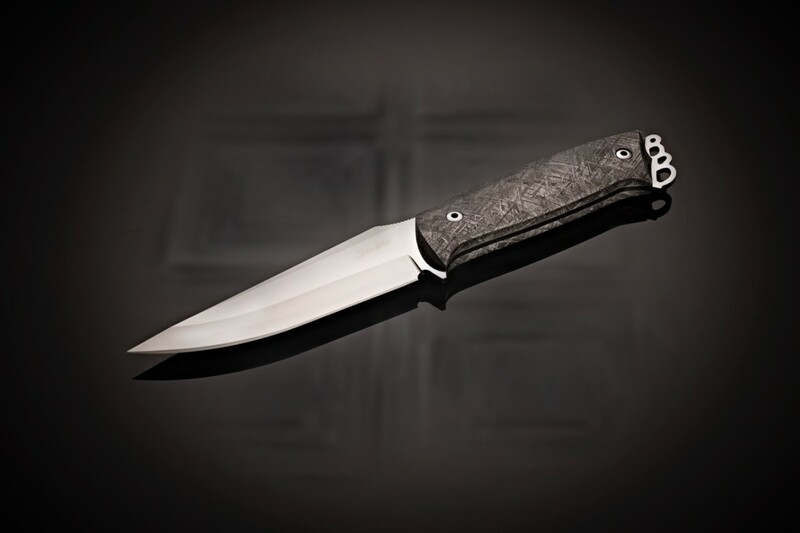 Several months earlier, and with the idea of making knives brewing for almost 20 years, we had developed a proprietary grade of tungsten carbide specifically engineered to make knife blades. While in a state of powder, tungsten carbide is green in color and can be easily broken with your fingers. Working it in this delicate state with CNC machines is an extremely fragile process and a trade secret we have used for two generations, we are abe to make seemingly impossible things possible. The next step in the construction of the knife was the sintering process in our HIP ovens for 20 hours. The process of sintering creates distortions of the initial profile and typically as a 20% shrinkage – in this case, we had to control that process as much as it was possible, and we did. Finally, grinding operations could start which is a great joy for me personally. My father did this before me and passed along a life of experience. At that point, and with the experience of our company in creating extraordinary industrial components in tungsten carbide for 40 years, I knew we were crafting something extremely special and needless to say given our experience with high tolerance construction, extremely precise . There were two aspects we carefully brought forward during the creation of the knife: first was the finishing, the second was the precision of the thickness of the knife. It is our daily business to create flat components in extraordinary tolerances. In this case, we decided to specify parallelism of the blade to a tolerance of 0.005 mm which equates to 0.0002” – that is far away the most precise knife ever made by man. Our advantage to create this precision relates to the material and high precision CNC multi-axis grinding which exceeds that which can be achieved by hand alone. One design element I dreamed about was to create an aspect of nature, something repeatable, in the finish, reminiscent of the meteoroid which travels at 160,000 miles per hour which would adorn the handles on the knife. Our first attempt was to employ a very rough diamond wheel followed by a very fine wheel in an attempt to polish the knife without removing the previous grinding marks; it almost worked but the effect was not quite what I had envisioned in my mind. Racking my brain for a solution, I remembered that we had a very old grinding wheel back in our warehouse, a 25-year-old wheel that when mounted into a grinder causes the defects of leaving grinding lines on the surface. The solution to say the least was unorthodox. We took what we Italians call the best engineer in the plan – A HAMMER – knowing the risk of what I was about to do I looked at the ancient grinding wheel as it rotated and gently hit it with the hammer, forcing an irregular rotation: I could see it taking shape and the finished effect was spectacular and new technique was born and I am certain that no one has ever done before. After two full days of grinding and sharpening, using some of the most sophisticated and accurate grinding equipment in the world, we completed the Big Bang Knife, It was a great satisfaction as we all looked at it, over and over again. We had just debuted the world’s first tungsten carbide knives just a month earlier, and creating the Big Bang Knife for Cabot Guns was a magical experience and a great way to announce to the world that the history of knife making has a new page. 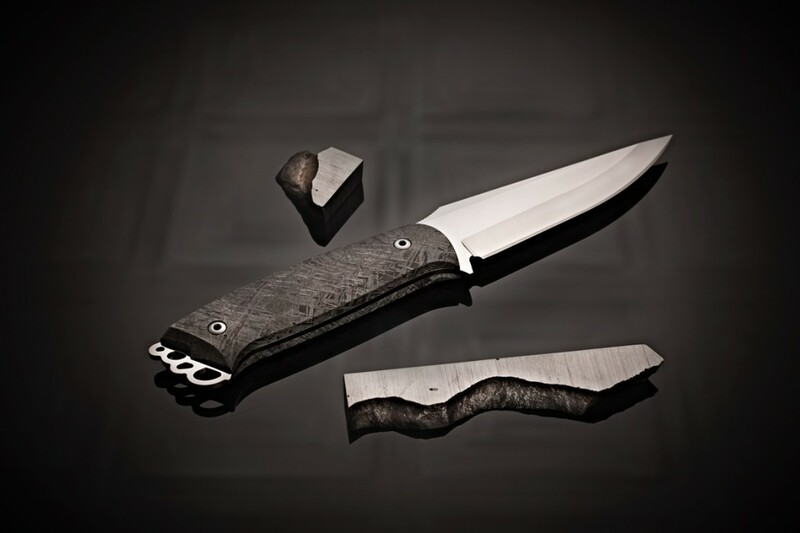 The blade was shipped to the United States where our partners at Cabot Guns crafted Gibeon meteorite handles from the same meteorite they created a set of pistols. One month on later on May 20, the Big Bang Knife debuted in America. And Sandrin Knives was born.